You've seen our previous infographic that outlined the benefits of roundabouts. While there are several benefits to incorporating these into your transportation network, they can also pose some challenges. One of those challenges is accommodating commercial trucks, especially on multilane roundabouts. When trucks meet roundabouts, there are two competing concerns: trucks being able to traverse it with their wide swept path and maintaining safe speeds for passenger cars in a clear roundabout. It was found that when roundabouts were designed to accommodate trucks within their lane, the fastest path speeds for passenger cars were outside of the safe limits. Also, when fastest path speeds were geometrically maintained within safe limits, the trucks could no longer traverse the roundabout in their lane. The compromise was to have trucks take up both lanes while traversing the roundabout. This compromise came with its own set of problems - reduced capacity and crashes caused when cars tried to overtake trucks in the roundabout. 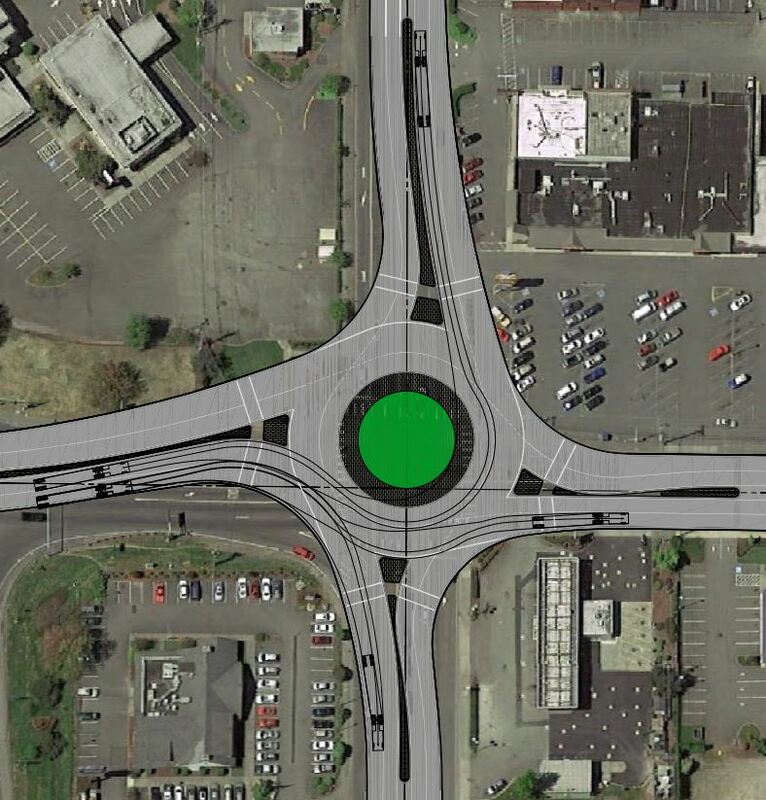 This was such a problem in Oregon, that the Oregon Trucking Association (OTA) pressured the Oregon Department of Transportation into issuing a moratorium on roundabouts on state routes. However, advances in roundabout design have now made roundabouts far more friendly for trucks. In fact, in 2012 the OTA supported lifting the moratorium. Case 1: Trucks require both lanes upon entry, circulating and exit. Case 2: Trucks can navigate the entry within their own lane, but may require both lanes to circulate and exit. Case 3: Trucks can complete all movements from within their own lane. Traditionally, all roundabouts have been a Case 1 design, because design sophistication had not advanced to the point of being able to design Case 2 or 3 while keeping fastest path speeds within safe limits. Now, a skilled designer with a suitable intersection can design a Case 3 roundabout with safe fastest path speeds. With trucks being able to traverse roundabouts in their own lane, their impact on capacity has been reduced and roundabout safety has been improved. This advancement in roundabout design opens up truck-heavy intersections on state routes to the benefits of roundabouts, which could mean greatly improved safety on state routes without compromising capacity or raising the ire of the trucking industry. Questions? Comments? I'd love to hear from you. Leave me a comment below, or send me an email at psmith@mackaysposito.com.